Doha, Qatar, 16 May 2017: Leading global business aviation company Deer Jet, presented the world’s first 787 ‘Dream Jet’, with its Middle East debut, making a stopover yesterday at Doha International Airport. The ‘flying’ visit is part of a series of showcases across the globe in Deer Jet’s “Dreams Encounter the World” tour of key international charter destinations. Established 22 years ago as the very first business jet operator in China, Deer Jet has been dedicated to serving the global premium business travel market, including Middle East royal families since 2013. Deer Jet is set to serve the market across the GCC and wider Middle East region, with buyers from Qatar, the UAE and Saudi Arabia expected to be key markets for the company. According to research by industry expert Hardy Sohanpal, in collaboration with Wealth-X and WingXAdvance, the Middle East has over 5,975 UHNW individuals (defined as having at least $30 million in assets) with a combined net worth of US$995 billion, further underscoring the company’s decision to target the region. In May 2016, Deer Jet took over the operation of the world’s first BBJ 787 VVIP, and made its maiden flight to Hong Kong in September. 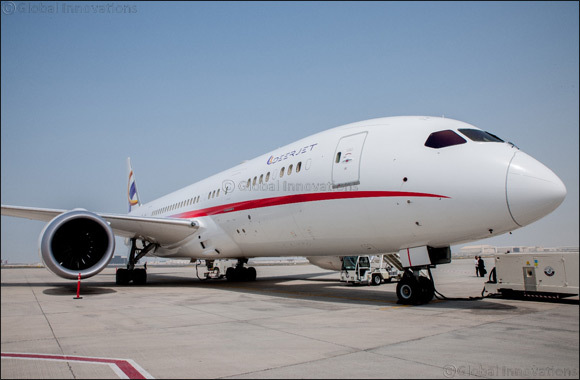 Deer Jet has branded the aircraft as “787 Dream Jet”, and launched a renewed brand philosophy of “Making Travel an Art”, as it builds on its reputation as a world leading service provider for premium business travel. With the 787 Dream Jet as its flying platform, Deer Jet has chosen the best pilots and first class stewards to deliver ultimate services and a superior travel experience for travellers. Pilots have over 2,000 hours’ international flight experience, plus more than 10 thousand total flying hours. A total of 12 pilots from almost 1,000 flying 787s for HNA Group have been selected to be part of the “Dream Team”. Deer Jet’s “Dream Team” stewards use 7-star hospitality standards, as true inflight butlers, evoking different feelings for the variety of customers they serve, in any given flight. In line with this the style and colour of cabin is frequently changed. Deer Jet curated spaces are decorated with hand-picked amenities and bespoke collections of precious crystals, cushions, silverware, and porcelain. “This new service in the Middle East market is just the first step for Deer Jet as we eye further expansion in the region. A growing generation of Premium travellers are looking to maximise their leisure time in the most opulent surroundings, not only do we make premium travel a slick and less time-consuming process, we also do it in superior style,” added Fang. The B787-8 Dream Jet can fly continuously for 18 and a half hours, or 16,000 kilometres, so given the geographical location of Doha, the Dream Jet can reach any major city in the world, non-stop. This is in part due to the aircraft’s fuselage, which is made from carbon fibre material, making it lighter and more fuel efficient. Prices start from $70,000 per hour. The Dream Jet also offers a more comfortable and healthier flying experience. Newly circulated clean air is accelerated in the cabin, ensuring a healthy environment for passengers as dust and any bacteria is filtered during the process of airflow. Deer Jet is also launching exclusive, bespoke travel packages aboard the 787 Dream Jet starting with the “Hong Kong to Tahiti Dream Journey”. It features a seven-night charter package including complimentary accommodation at the Presidential Suite of St. Regis Bora Bora Resort. It plans to add more itineraries in the future as part of its goal to create seamless travel to fulfil its vision of “Making travel an art”, through best-in-class service inspired by Deer Jet’s values of “elegance”, “performance” and “distinction”. The aircraft is operated on the Guernsey aircraft registry (2-DEER), under the AOC of BAS Guernsey. The aircraft resides at Hong Kong International Airport and is operated by Deer Jet’s subsidiary, Hong Kong Jet. Dubai and Riyadh are slated as the next stops for the Dream Jet.